I carry a USB drive containing my software toolkit: various programs for removing malware, tuning up Windows, installing updates, etc. Some are installers that install programs to a hard drive, and others are portable applications that run straight from the USB drive without hard drive installation. Because most of these programs are frequently updated, it’s a chore to keep them all current. Ketarin is the best installer updater I’ve found so far. 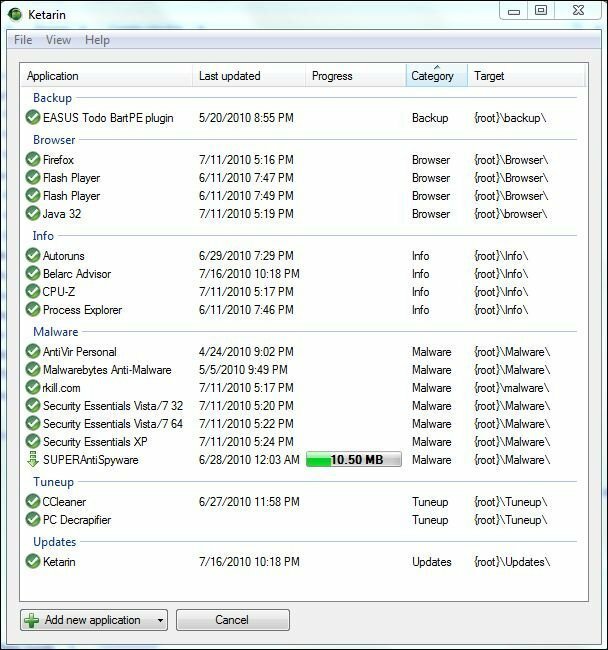 Now, I’m not talking about updating software that is already installed on PCs; there are plenty of programs, like CNET TechTracker and FileHippo Update Checker that will scan your PC for installed software, then provide updated versions. What I needed, however, was a way to ensure that my USB drive always had the latest installers, so I could install the latest copy of Firefox or Microsoft Security Essentials on a client’s PC at a moment’s notice. Ketarin integrates closely with FileHippo.com. When you enter a program’s FileHippo ID into Ketarin, Ketarin retrieves the name and download link for the program. When Ketarin checks for updates, it compares the version you have with what FileHippo has, then downloads the newer version (if there is one). Ketarin isn’t limited to software that’s available from FileHippo; you can give it the download link for any software, and it will do the same version checking and updating. Ketarin is produced by the creator of CDBurnerXP, in case you wonder why the Ketarin Knowledgebase is on the CDBurnerXP site. Extract the zip file to a USB drive (or hard drive; wherever you plan to use it). Click the Add new applicationbutton at the bottom. Application name: the name of the program. Shortcut: if you paste a FileHippo ID into the FileHippo ID field, it’ll auto-fill the Application name. Category: you can optionally categorize your applications. Download source: paste the URL for software not on FileHippo, or the FileHippo ID. See my instructions below for finding download sources. Download location: where the installer should be saved. I use Save in folder, then enter the category folder. I created folders on my USB drive for various categories (backup, browser, malware, etc. ), and use the variables listed in the Ketarin Knowledgebase. If necessary, fill in the other tabs (Advanced settings, Commands, Information). Click OK. Repeat for additional applications. Click Update now. Ketarin will connect to the download sources and download the latest installers. Don’t forget to review the Ketarin settings in File > Settings. By default, Ketarin saves the database of your applications in %appdata%/Ketarin. To make Ketarin completely portable, close Ketarin, then copy the contents of this folder into the folder containing Ketarin.exe. Using FileHippo IDs is the simplest method for finding an application’s download source. For programs not available on FileHippo, it may take a little hunting and trial and error to get the source right. Search for the program on FileHippo. The part of the URL after filehippo.com/ is the FileHippo ID. 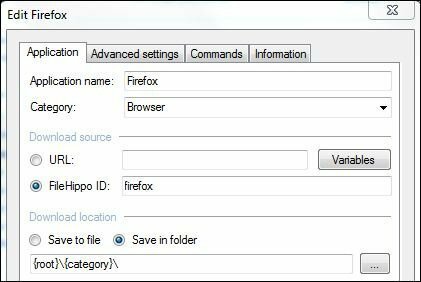 For example, for Firefox, the URL is http://www.filehippo.com/download_firefox, so the FileHippo ID is download_firefox. If the program isn’t on FileHippo, find the download link, and copy the URL. 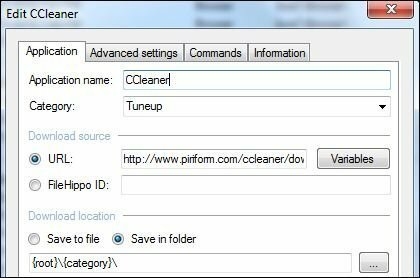 For example, for CCleaner Portable, the link is http://www.piriform.com/ccleaner/download/portable/downloadfile. For programs that have single installers (msi or exe files), Ketarin will download the latest installer. For portable apps that come in archives (like zip files), Ketarin will download the latest zip file, and you’ll have to extract it on your own. Ketarin isn’t perfect, but it’s by far the best solution I’ve found for keeping my software toolkit updated. I highly recommend it! Please share your thoughts in the comments! As always, contact OptimWise for more information or assistance!